As the farm sector lurches through a painful economic slowdown, many are leery of another farm financial crisis. While a full discussion of the differences and similarities of these periods would require a significant amount of discussion and analysis, we thought that it would be useful to examine one key area in which the current situation differs significantly from the 1970’s farm boom and 1980’s bust. 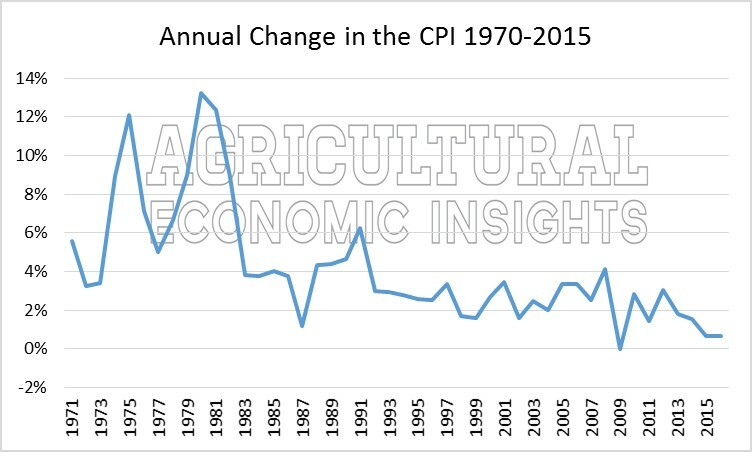 Heading into the 1980’s farm crisis the general economy experienced inflation levels much higher than anything seen in recent times. Annual inflation rates peaked above 12% three times during the 1970s and 1980s (1974, 1979, & 1980). Rates were at their highest in 1979 and 1980 when double-digit rates were observed for two consecutive years (13.3% in 1979 and 12.4% in 1980) (Figure 1). These high rates had many undesirable impacts on the broader economy, but they were particularly distortionary for the farm sector. Figure 1. U.S. Annual Inflation Rates based on the Consumer Price Index (CPI) 1970-2015. Data Source U.S. Bureau of Labor Statistics, retrieved from FRED Database, Federal Reserve Bank of St. Louis. The high rates of inflation encouraged people to search for investments that provided protection from inflation. Farmland was viewed as one such investment. As a result, buyers were willing to invest in farmland with the expectation of inflation driven valuation increases. These expectations were then dashed when inflation was brought under control. This search for an inflation hedge was further complicated by the fact that the high rates of inflation resulted in very low real interest rates, making it attractive to use financial leverage to purchase farmland. Inflation also made it difficult to recognize the relative levels of commodity prices. In nominal terms, corn prices first peaked in 1974 at $3.02 per bushel before falling to $2.02 in 1977 (Figure 2). 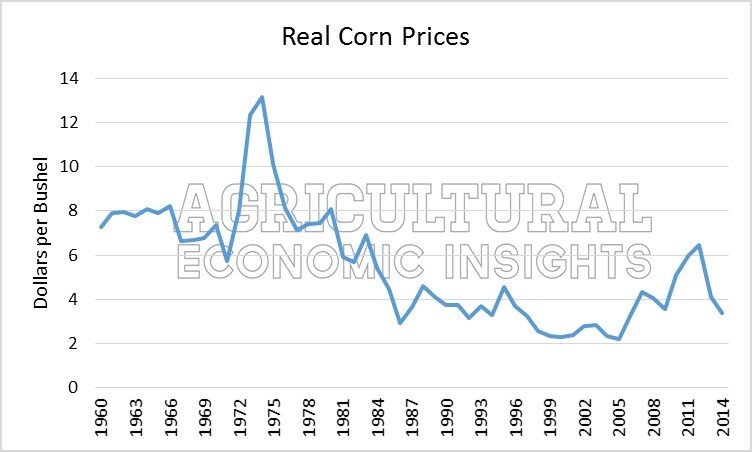 However, many people are surprised to learn that in nominal terms corn prices actually rebounded to slightly over $3 per bushel twice in the early 1980s. In 1980 corn prices hit $3.11 and in 1983 they reached $3.21 per bushel. Figure 2. 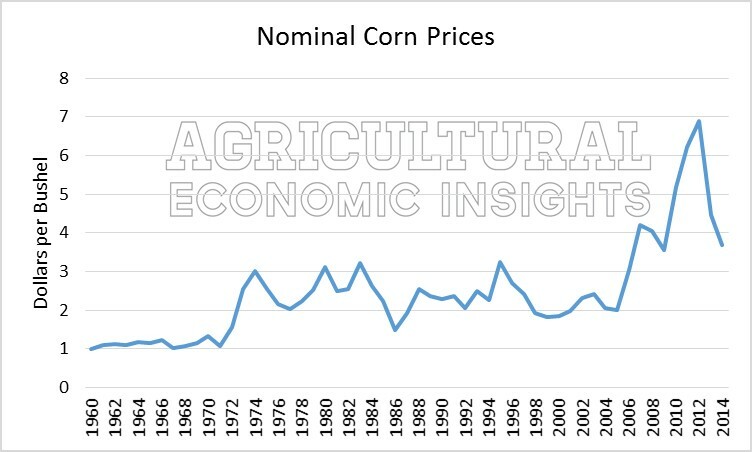 Nominal Corn Prices, 1960-2015. The only problem with this rebound was that in real terms this represented a significant decline in corn prices. As can be seen in Figure 3, the “rebound” in corn prices was completely wiped out by the sky high inflation rates of the period. In fact, using real 2009 dollars, the 1974 price spike would equate to slightly over $13 per bushel in 2009 dollars. When adjusted for inflation, the rebound price of 1980 was just over $8 per bushel for a real decline of 38%. After adjusting for inflation, the 1983 price was again lower at $6.91 per bushel. In other words, inflation took a huge bite out of price levels, while nominal prices were higher. Figure 3. Real (2009) Corn Prices, 1960-2015. Further compounding problems, the medicine used to cure the high inflation rates was one of high nominal interest rates. The U.S. prime bank interest rate hit 20% in December of 1980 and stayed above 17% until November of 1981. For 6 of those 11 months the prime rate was in excess of a staggering 20%. As we discussed here, this had the impact of creating a tremendous spike in real interest rates. These high nominal and real interest rates set off a tremendous financial crash in the sector that had levered up in a period of low real interest rates. Currently inflation rates have been very low. They have regularly registered below 4% since the 1990. Since 2000 the inflation rate has averaged 2.1% with a peak of 4.1% in 2007. More recently, inflation has been below 2% since 2011. The contrast between the 1970s and today is probably greatest when it comes to inflation. Today’s rates are simply much, much lower than that experienced in the 1970s. There are certainly prognosticators that have worried about increasing rates of inflation. To this point inflation remains stubbornly low, so much so that monetary policy makers have regularly been worried about too little inflation as opposed to too much inflation. It is always possible that things could change rapidly, but at present inflation remains very low. Although there are clearly similarities between the situation today and the previous bust, there are also many major differences. We believe that the difference between inflation rates is one of the most important. While the lack of inflation to date does not insulate the farm economy from a major bust, it certainly doesn’t hurt. On the other hand in some ways the ag sector is experiencing its own version of deflation, as output prices (and now input prices) fall. Our feeling is that whether this becomes a serious problem will likely depend upon the extent to which farmers have used too much leverage. While sector level indications suggest that the debt load is manageable, debts are not repaid at the sector level. Some farms and agribusinesses will undoubtedly be over levered and experience financial difficulty. Whether this presents serious systematic problems will depend on how many farmers find themselves in this situation. In comparing the situation to the 1980s we think that it is important to remember just how bad the 1980’s were. They were terrible.The crisis put tremendous strains on rural communities and the institutions that financed agriculture. In this study Stam and Dixon chronicle how the bankruptcy rate during this period exceeded even that of the Great Depression. According to a 1991 study by Hanson, Parandvash, and Ryan at the peak of the crisis, nearly 17% of U.S. farms were financially stressed and by 1985 over 46,000 commercial farms were insolvent. Unless conditions deteriorate substantially we think it unlikely that anything approaching that number will be realized, and that is indeed a good thing. Hanson, Gregory, G.H. Parandvash, and J.Ryan. “Loan Repayment Problems of Farmers in the Mid-1980’s.” United State Department of Agriculture: Agricultural Economic Report Number 649. 1991.